Keep your pooch warm and toasty in wet or winter weather with this free pattern for an easy-to-sew dog coat! Your best friend will stay cozy while out for a walk and they'll look cuter than ever. This pattern fits small dogs, but you can alter the size of the pattern to fit your pet. 1/2 yard or 18 by 22 inch rectangle of water-resistant fabric, such as windbreaker nylon. Optional: Reflective strips, so the dog is visible in poor lighting. For best results, be sure to read through all the instructions before you begin. Download and print the pattern pieces. Be sure to print the pieces at 100 percent or as close to 100 percent as possible. The most important thing is that all of the pieces print at the same size so they fit together. Tape the small pieces to the large piece, matching the letters to each other. Using the on fold line on the pattern piece, cut out one of the pattern pieces in the nylon and one in the fleece fabric. Note: It is important that the fabric grain is straight on the fold. Do this by measuring the distance of the selvage to the fold and keeping the distance even. 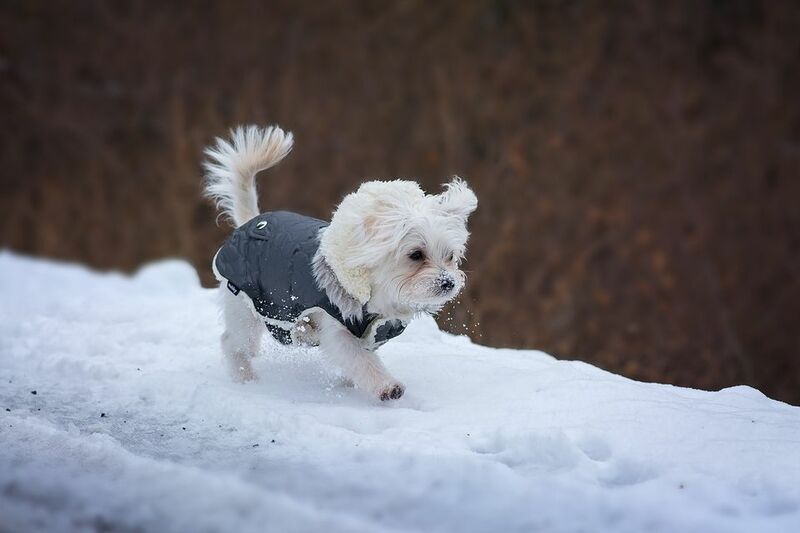 Optional: To add extra warmth to your dog's coat, cut a matching piece of cotton batting and quilt it to the outer fabric before sewing the layers together. Pin the fabric and fleece pieces together, aligning the edges, with the right sides together. If you are using a vinyl fabric, use clips instead of pins, since straight pins will pierce the vinyl and ruin the waterproof qualities. Stitch the layers together using a 3/8 inch seam allowance, leaving an area open for turning. Clip all the curves and trim the corners to reduce bulk. Turn the dog coat right side out through the opening. Poke the corners into shape and make sure all the seams are open. You can press the seams, but take care that your iron is set for the correct fabric. Fold the seam allowance in along the opening, clipping if needed. Pin the opening closed. Top stitch the edges of the entire coat, sewing the opening closed at the same time. Pin a 2 inch piece of hook and loop tape on each of the four tabs of the dog coat. 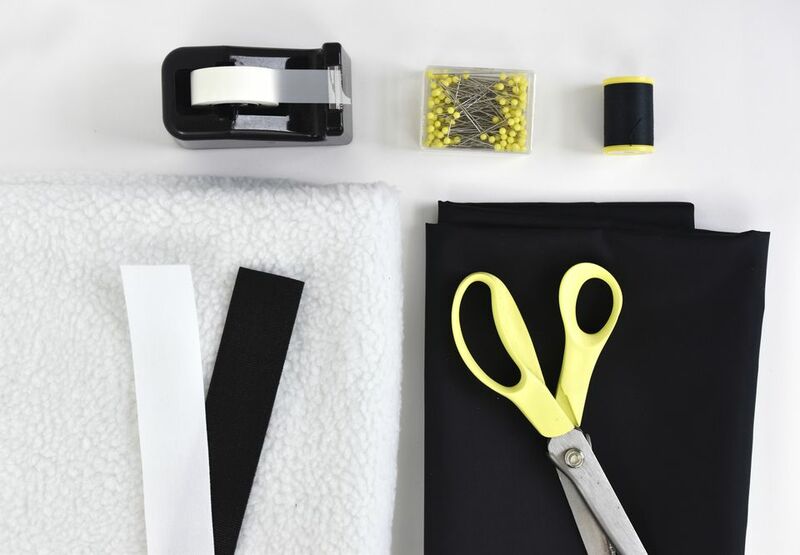 Place one side of the hook and loop tape on the outer fabric of the coat and ​the other half of the tape on the fleece side of the fabric. If possible, match the tape color to the fabric. The tape in the sample above is double-sided, which makes it a little softer while eliminating the waste of one side of the tape. Stitch the hook and loop tape in place, using thread that matches the outside of the coat. Embroider your dog's name on the back of the coat. Sew a little pocket on the coat and store your contact information inside. Stitch a cute tag into the seam for a fun detail. Enlarge or reduce the size of the pattern as needed to fit your animal friend.